The previous owner of my '03-#4531 removed the rear seat console to install a BIG subwoffer so I would like to find another or a rear seat to fill the gap. I know there will be some fabrication involved to make a seat fit in the center, but I'm desperate. Can anyone help this old carburetored small block Chevy loving dinosaur out? The 03 has a rear center console. Got any pics of how it looks with the sub? Take a look here. -> http://www.nhtoc.com/vbforum/showthr...l=1#post611327 Is this what you're talking about? Here's a good third seat how-to link. The how-to is a good guide. During my install I realized one difference to keep in mind. The member that made the how-to used a passenger seat whereas I used a driver side rear seat. The front legs of the driver/passenger side seats are opposite of one another so if you use a DS seat the mounting of the front legs as described in Step #9 of the how-to is not correct. Instead of shimming the front legs I used a BFH to massage the floor flat. To get the legs lined up Ryan and I used a chalk line. Here's a bunch of pics I compiled from over the years. I can post the links for the threads these pics came from but there's not much if any tech information in them. I really enjoy the aesthetics and functionality of this mod. No, it was huge and not at all well engineered. Looked totally out of place. It was gone a half hour after I brought the truck home. Exactly. 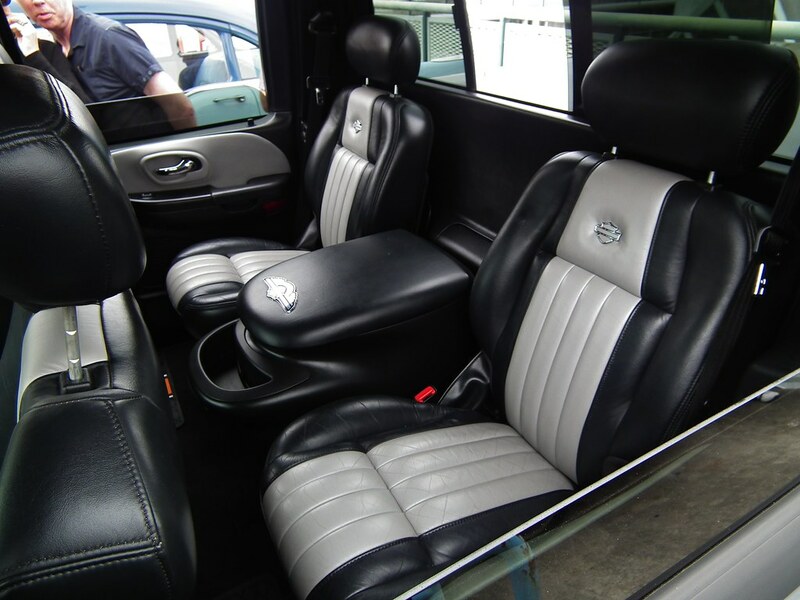 The third seat is my first choice, but I would do the center console if I could find one. The 60/40 seat looks awesome. What did they come in? A normal crew cab I assume. There is a set of rear seats and console for sale on ebay right now. Probably not the cheapest, but you can have them now, and recoup some cost selling the other seat and console, and not have to wait to find one in a junkyard, etc. I'd have to look but I think I have a stock console in my stash I might part with. If tpr103 doesn't or never had the rear console anymore, there's a set of rear seats and console in really good condition on eBay. Allen, what did you do for a seatbelt on your third seat? After reading through the post you referenced it looks like you can get an aftermarket seat belt to work with the factory seat belt latch. Curious if you went this route or did something else. Shawn... when I bought my third rear seat I also asked for the factory seat belt and all hardware. Unfortunately the receiving end doesn't work with the third seat because the cable is too long. On the driver and passenger seats the receiving end mounts low on the floor near the corner of the door jamb. Since the third seat is an after-thought there's no where to safely attach the factory receiving end. I bought a lap belt off ebay from a store called Penasco Point Parts. I didn't expect much use of the third seat so I almost didn't install a belt. In the end that seemed half-assed and I wanted to ensure full functionality and safety. The 2-point lap belt suit my needs well because its stowed away under the seat completely out of sight. My only complaint is that 60" is a little longer than is necessary. With 60" you can strap a bariatric rider and still have belt to spare. If it really bothered me I would have the belt shortened a little bit but its really not necessary.